"A Hecatomb in Cheektowaga" is a 2:38 video, in the style of a public service announcement or political ad, featuring recent (Summer 2005) events in the town of Cheektowaga, New York, USA. Many people do not see the point of looking at the scenery if they do not have a digital device which allows them to record and transform it. Moreover, when one looks at nature through a digital device, what one sees is influenced by the act of making the recording. This “digital stance” towards wild nature changes how we conceive wildness. Because we can manipulate the images of nature that we record on our devices, we begin to think that we can manipulate nature itself to suit our aesthetic and recreational goals. This view of nature was played out in a recent event in Cheektowaga, New York (USA): Stiglmeier Park, a large park, is located next to a nature reserve. Recently, the town decided that the deer were unsightly and needed to be removed because they interfered with the activities of humans. Seventy-eight deer were slaughtered in a single month. With the deer gone, the park became overrun by geese. 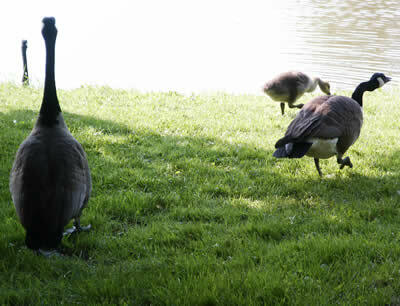 Geese, with their droppings, feathers, honking, and hostility, did not suit the aesthetic sense town planners had of their “residents’ park.” In June 2005, 106 geese were captured and killed, leaving only 17 survivors. The extermination in Cheektowaga may not stop with deer and geese. Rats, too, are a perceived problem in a working class neighborhood called Cedargrove Heights. According to the town authorities, the rats are unsightly. Therefore, the Town Supervisor, Dennis Gabyrszak, and others in the town government have cooperated with a developer who wants to raze the entire neighborhood and replace it with a new development, called Renaissance Village. When we visited Cedargrove Heights, we found a neighborhood full of children playing in the ample green spaces, and houses that people had lived in for their entire lives and had improved over the years. There were also large numbers of protest signs put up by residents who did not want to lose their homes.